GLOGIRLY: Waffles Wednesday: Pimp My WHAT??? 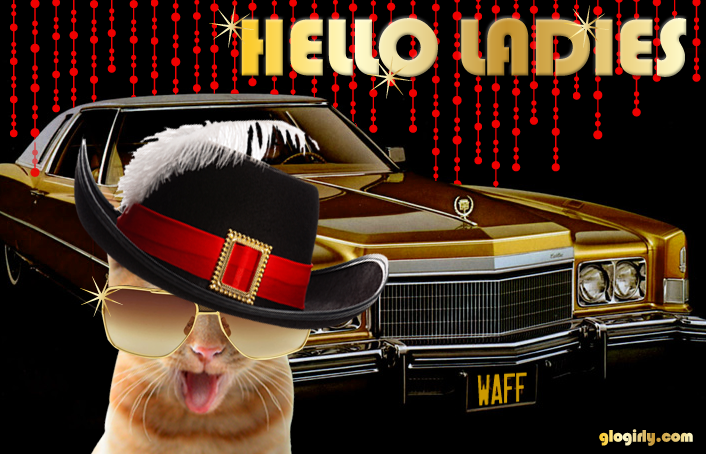 WAFFLES: Hello, ladies! The Waff's got a new wagon. Wanna take a ride? KATIE: Waffles! What on earth are you doing? This is a family blog! 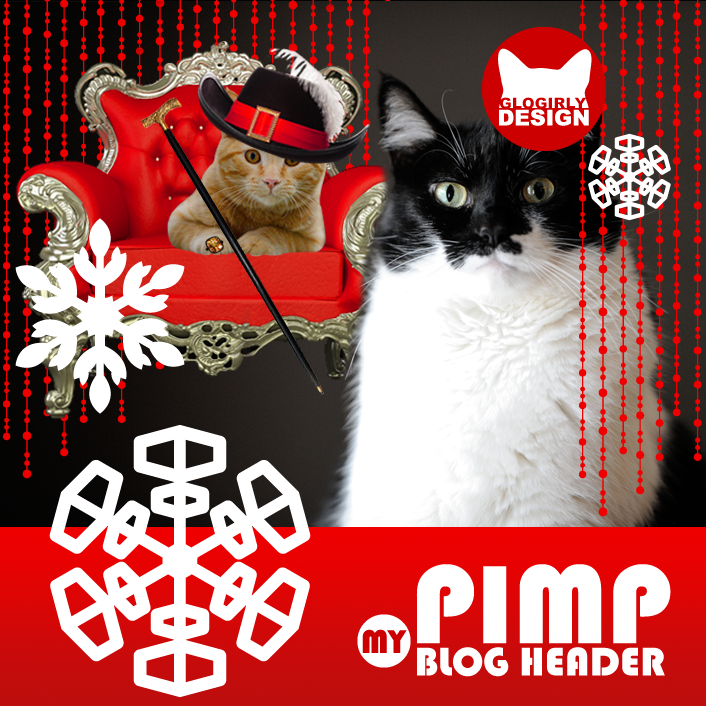 WAFFLES: But Boss, Glogirly said we're going to primp some blog headers. You know, make them fancy and stuff. And she wanted ME to announce it on Waffles Wednesday. KATIE: Primp? You look more like a P-I-M-P.
WAFFLES: BOSS! Glogirly says I'm too young to use that word! It's got four letters and everything. KATIE: Settle down, Waffles. Despite your crazy get-up, it's not that kind of pimp. Some of the most fun holidays of the year are right around the corner and we've got just the special flair you've been dreaming of. Whether you're looking for a santa hats and snowflakes or jack-o'-lanterns and candy corn, we can help. And if you want a whole new 'do? ...well we can do that too. Just email Glogirly for details: glogirl@visi.com. Pimpin' or primpin' ... we always love what you do, gang! Oh we've been thinking bout this already! You make an adorable "primp" Waffles! We so need a primp for Mum's shop for Christmas!! Waffles, only you could make a holiday announcement into something, uh, different! Are you coming to Barkworld, BTW? 'Cause I am! Always love your visuals. I'm sure you'll do a great job on the header as well. Ha ha ha! You're too funny Mr. Waffles! Oh yeah, Mum loves your hat. Waffles! You put that stuff away right now..you are to young & cute for that sort of thing!! Besides..you can't drive that car..Glogirly has to drive the Waffles Wagon for you!!! Oh My..what do we do with these youngsters..MOL..
You sport the hat & shades well!!!! Sorry, Katie!!!!!!!! Wow dat's weally cool. Maybe sumday weez can afford sumfin' like dat. Hav a pawsum day. Pimp or primp, you look great Waff. Love the ring! Oh. My. Cat. Thank Glogirly for the pimp, er PRIMP work she’s done for me. The holidays are coming so one has to prepare. Love the GG logo with the santa hat!! Faraday: *disgusted look* I swearz, Maxwell's BLUSHING. Waffles you always make me smile. Waff, you need to pimp out the Waffle Wagon! Waffles - you are one crazy dude! Waffles, can I be your Lady?! Another four letter word.